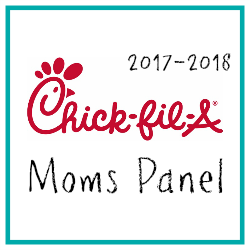 Answer: A fabulously good time. 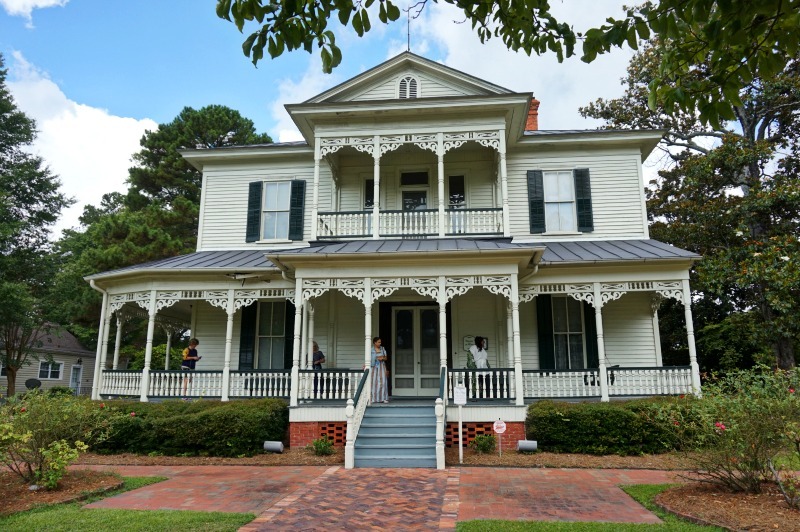 A few weeks ago, I was invited by SoFluential and The Fayetteville Areas Convention and Visitors Bureau to take a tour of Fayetteville, North Carolina. Fayetteville holds many good memories for me. It was the place where I met Mr. A, where I graduated with my first degree, and it is currently where my parents have planted their roots. Still, on the surface, Fayetteville can be mistaken as one of the many other military towns whose reputations sometimes precedes itself. But once you take a closer look, you'll see that Fayetteville has some serious small town charm and rich history. You just have to know where to go to unlock all that Fayetteville has to offer. Recommendations: Ideal for people who want to be close to Skibo Rd, the main strip in Fayetteville that features endless dining, shopping and entertainment options. 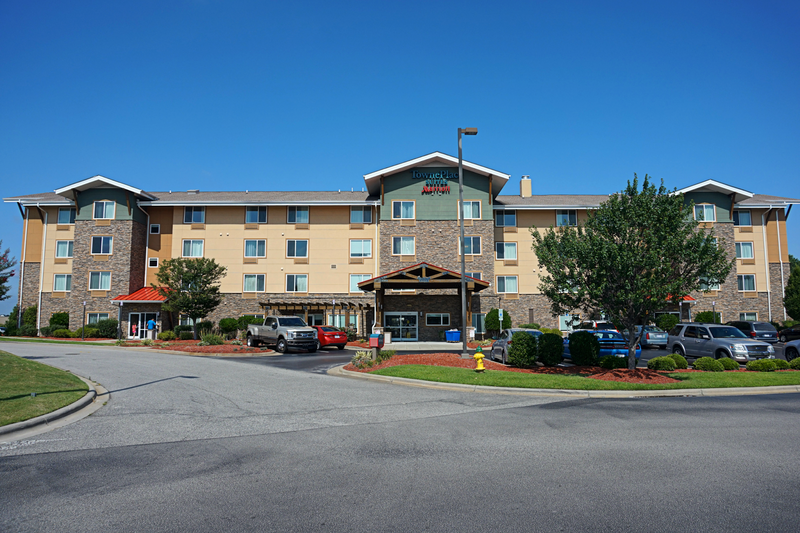 Conveniently located in the premier area of Fayetteville, the newly renovated TownePlace Suites offers guest all the comforts of home at an affordable price. 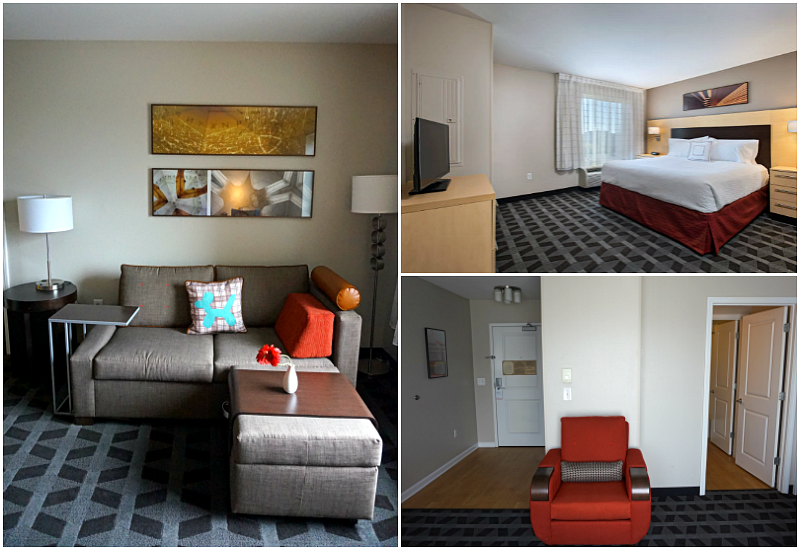 Guests have access to amenities such as a delicious hot continental breakfast, gated outdoor swimming pool, fully equipped fitness center, and free Wi-Fi for the duration of your stay. Because I arrived at the hotel so late, I was treated to a complimentary upgrade and ended up in a suite (score). The suites are spacious and include a fully equipped kitchen, which is fantastic if you intend to stay for an extended period and prefer to cook your own food. But in the event that you'd rather not cook, there are three restaurants located within walking distance of the hotel. Breakfast wise, there is plenty to choose from. I've stayed in plenty of hotels that advertise a "free continental breakfast" only to find myself eating cold cereal, and fruit. 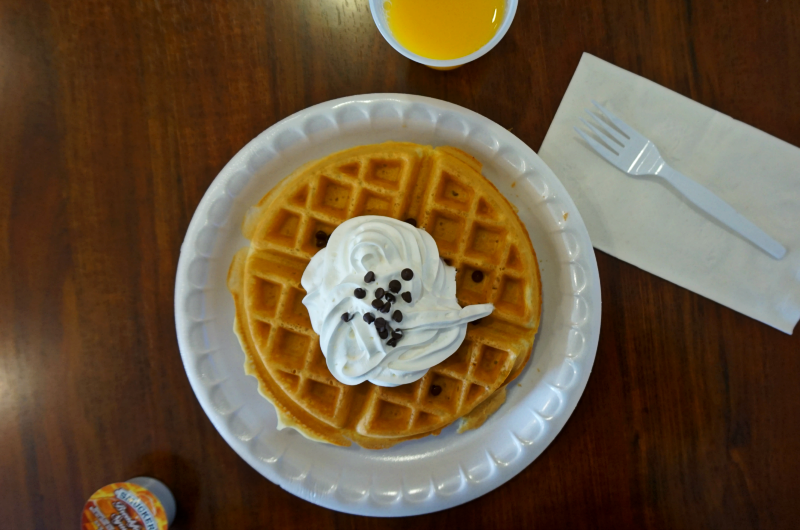 TownPlace Suites provides guests with plenty of breakfast ideas to suit your tastes-- yogurt, cereal, fruit, waffles, pancakes, orange juice, coffee and much more. Recommendations: Be sure to come dressed for the occasion. Stick to gym attire. Sneakers are not necessary as you will be given climbing shoes. Bring your own socks. If you're feeling a bit daring, The Climbing Place is a fantastic place to feed your adventurous side. The Climbing Place has been around since 1995, and is a favorite hangout for Fayetteville residents. 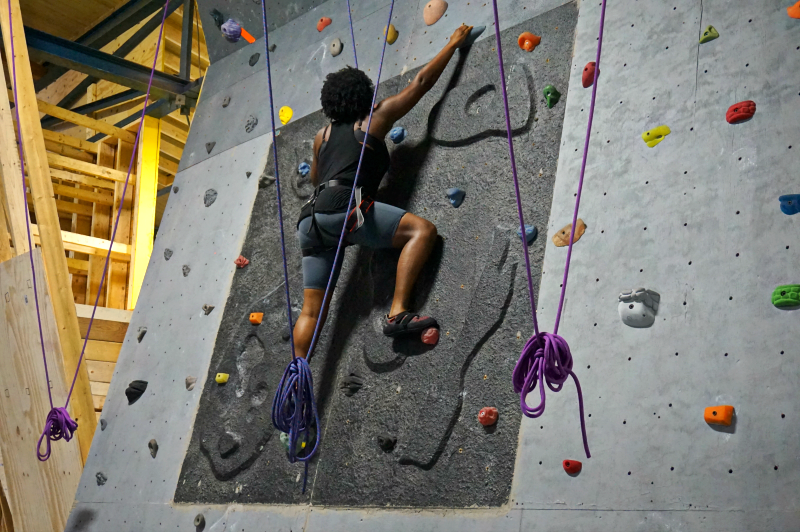 The 18,000 square foot climbing facility is the largest indoor rock climbing center in North Carolina. It features more than 40,000 climbing holds, 60 top ropes, a massive overhang area, a 300 foot gym traverse and thousands of square feet of bouldering surface as well as a top-out boulder. No climbing experience is needed, and all ages are welcome. We started off our session by changing outfits, getting fitted for our harnesses and picking out a pair of specialized climbing shoes.Though none of us had any prior climbing experience, our instructor, Nadia was incredible. One by one, she challenged each of us to exceed our comfort zones and go all the way. 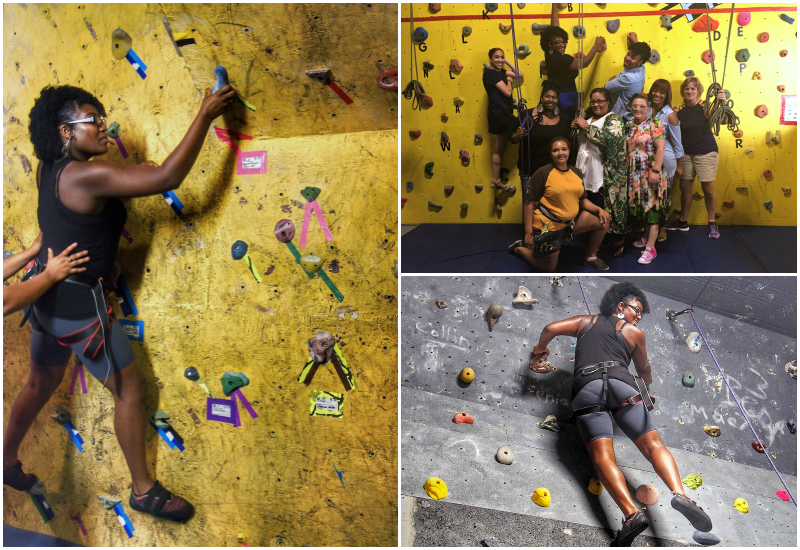 The Climbing Place is an EXCELLENT team building experience for adults and teens, or if you're looking for ways to get the kiddos involved, they offer weekly summer camp classes. 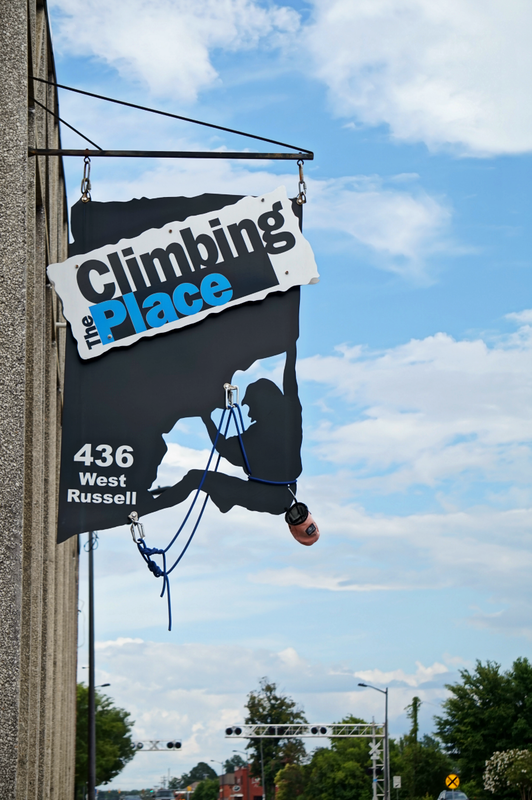 To find out more about The Climbing Place, visit their website or drop in for on hand experience. Recommendations: Intended for older crowds. No artistic skill required. Bring your own wine. And be sure to bring an extra bit of cash for a tip! 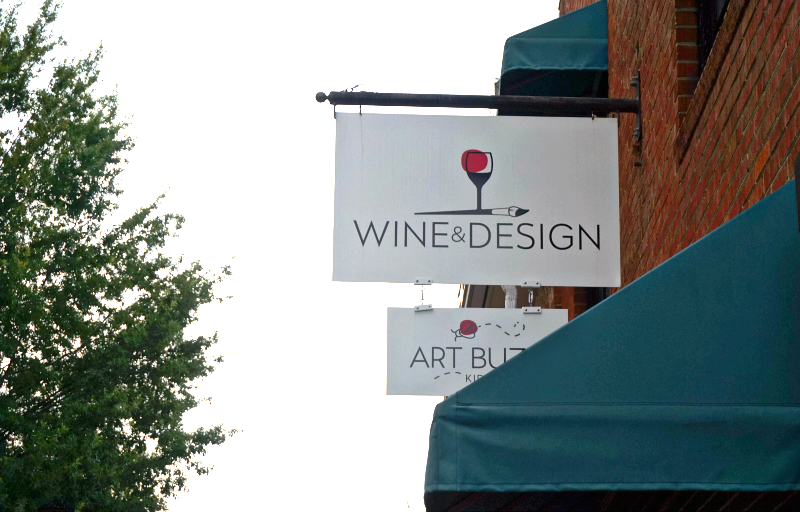 Wine and Design of Fayetteville is one of a series of chains. Located just off of Hay Street, it's an ideal location for people looking to maximize date night without straying to far away from the downtown area. This was our final stop of the night. Most of us were a bit unsure of what to expect, but by the time we left, we were painting pro's. 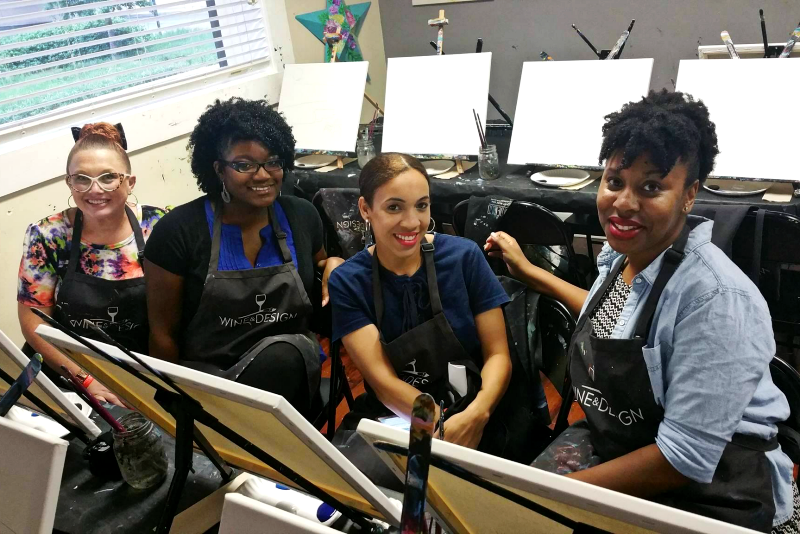 Before the class began, our instructor introduced herself and walked us through the image we would be tasked with painting. Admittedly, it was a bit harder than we anticipated, but our instructors witty personality made it easy to relax and enjoy the fun. One of the many appeals of Wine and Design is that zero artistic ability is necessary. Just arrive with a good attitude and good wine, and prepare for a good time. 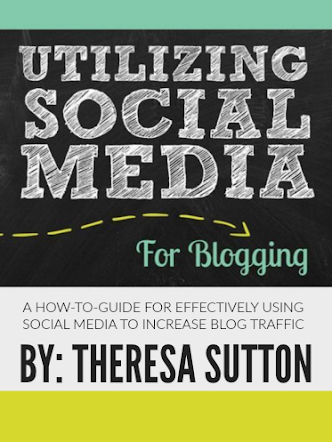 Your instructor will walk you through your design step by step. If additional help is needed, or you've made a mistake, your instructor can easily guide you through the necessary steps needed to repair your work of art. 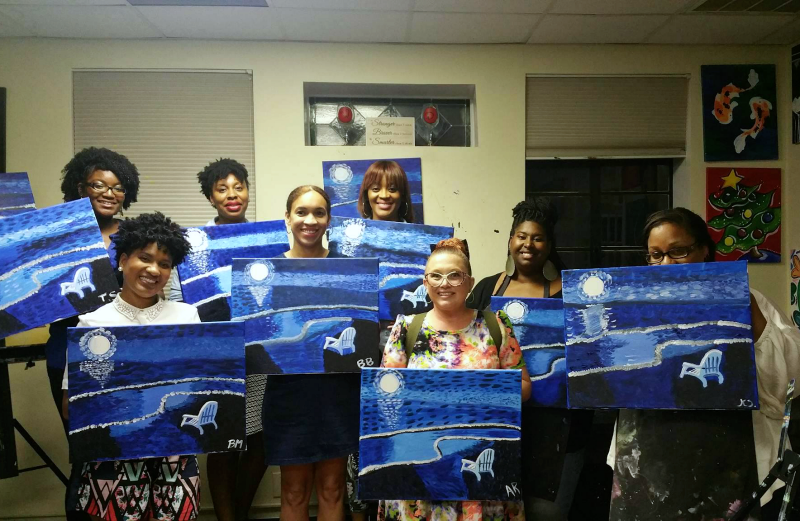 There are roughly 18 seats available at Wine and Design, so if you intend to bring a large group, be sure to book well in advance to ensure your whole group can enjoy the fun! Be sure to check out Wine and Design Fayetteville online for more information about group parties and discounts! Recommendations: Feel free to bring a camera, but don't touch the displays. Most of the items in the Poe House have been passed down from the original owner and are incredibly old and valuable. The Cape Fear Museum and Poe house are essentially the heart of Fayetteville. Another hidden gem in the Hay Street area, The Cape Fear Museum provides visitors with a window to the past. The historical complex includes the museum that contains more than 400 years of history. 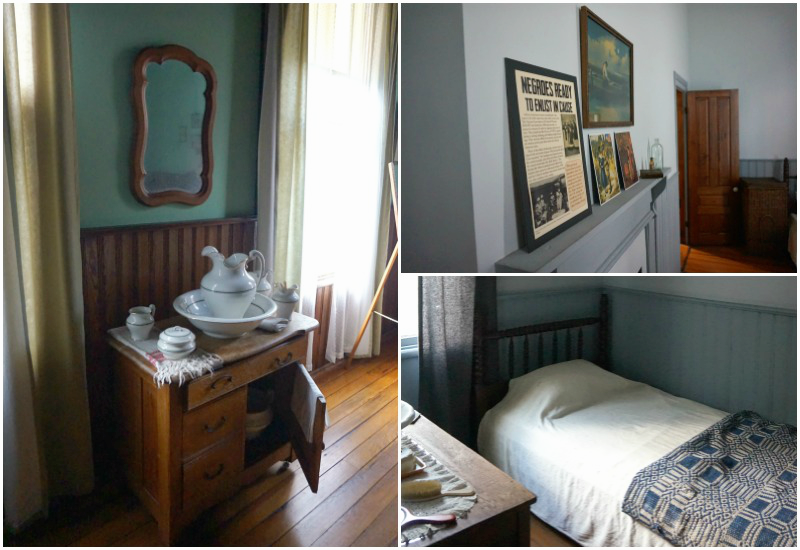 The Poe House is a stunning Victorian home that has been preserved to showcase life during the early 1900's. The final surviving member of the Poe family donated the Poe house to the city of Fayetteville to help preserve the legacy and showcase what life was like during the turn of the 19th century. Upon entering the house, you will be transported into the past where you will be given a small glimpses into the daily life of the Poe family. Our group traveled from room to room in complete awe of the home. Each room is designed in such a way that we physically felt as though we had traveled back into the past. The Cape Fear Museum is perfect for new and old residents of Fayetteville interested in learning more about the history of the city. Keep an eye on the Cape Fear website for information regarding special events and tour times. Admission into both the Poe House and Cape Fear Museum is free, but donations are always appreciated! Recommendations: Be sure to try their assortment of caramel and chocolate dipped fruits. They are life changing! 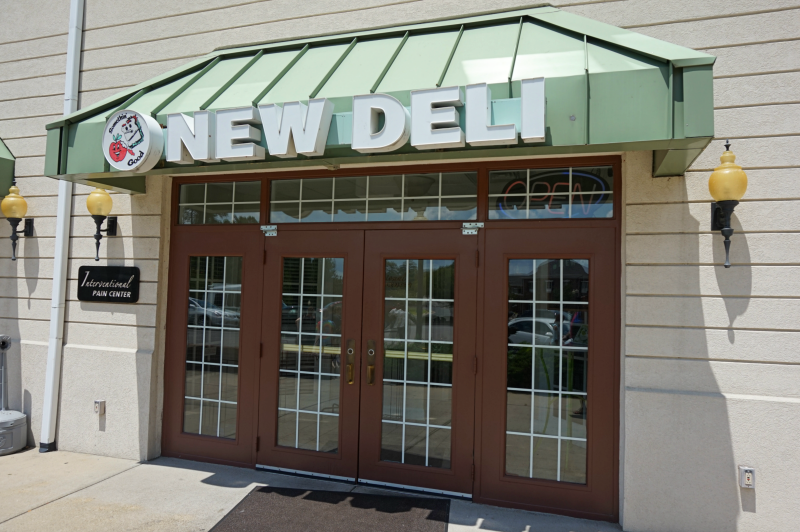 Another staple of the downtown area, New Deli, is the perfect place to stop in for a quick brunch, or lunch. After shopping until we dropped, we stopped into New Deli to fuel up for the rest of our tour. 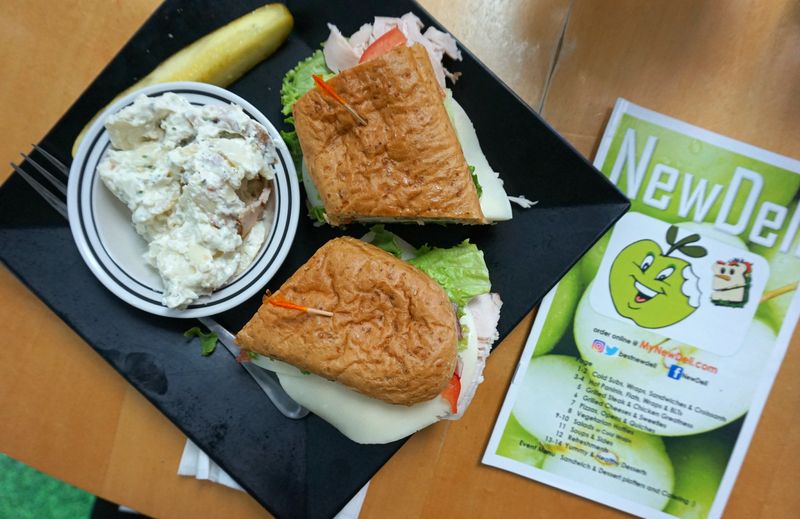 I kept it simple by ordering the a simple turkey sandwich, but their menu is filled with a variety of options for those more interested in taking a walk on the wild side. 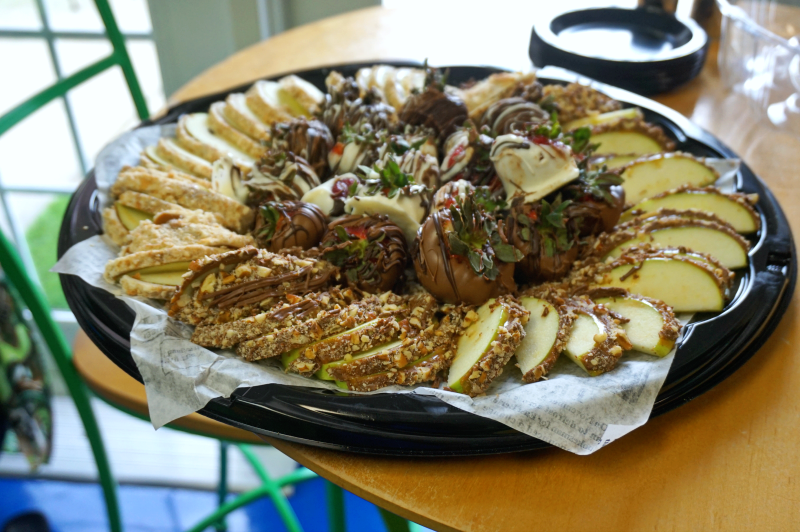 For dessert, we were treated to a fabulous tray of Oh-So Delicious caramel and chocolate dipped apples and strawberries. New Deli is perfect for people who are interested in maintaining a healthy lifestyle, but still enjoy a bit of chocolate every now and then. Recommendations: Come prepared to eat with chopsticks (note: silverware is available). The Butterfly tea is a must! 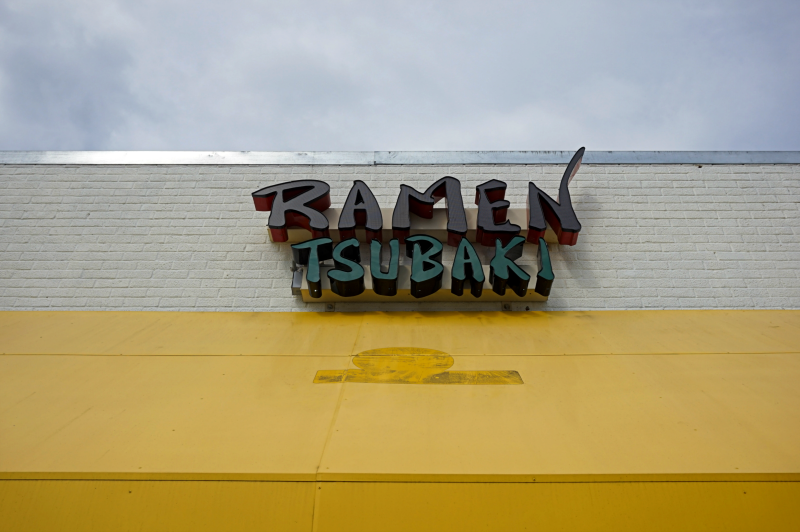 Located just off of McPhereson Church Road, Ramen-Tsubaki every Ramen lovers dream! 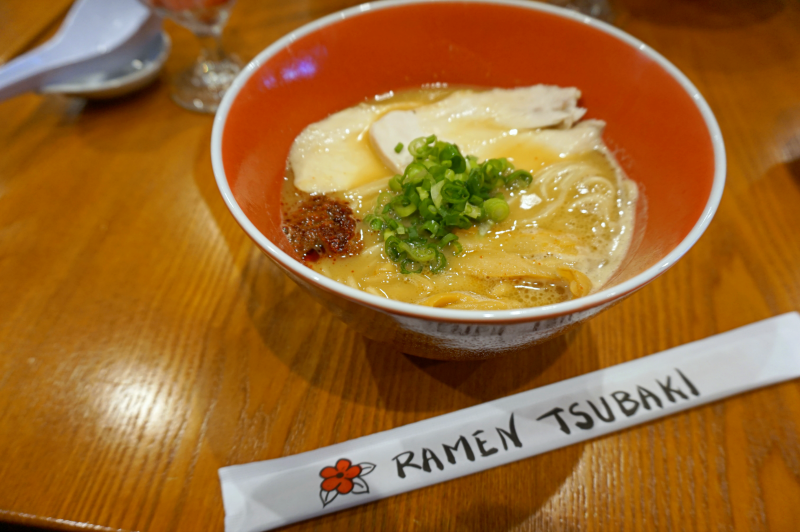 For dinner, we had the opportunity to drop by Ramen Tsubaki. Upon entering the restaurant, we were immediately struck by how friendly the owner was, not only with our group, but with everyone who entered the restaurant. The menu at Ramen-Tsubaki is fairly simple, but still provides diners with an authentic Japanese dinning experience. You can choose from a selection of appetizers, including Gyoza and Tsubaki rolls before moving on to a mouthwatering selection of Ramen. In the event that you're not in the mood for Ramen, there are several rice bowls to choose from. Recommendations: Forget everything you ever thought you knew about tea and come with a open mind, ready to learn. Did you know that you can pair tea with brownies and chocolate chip cookies? 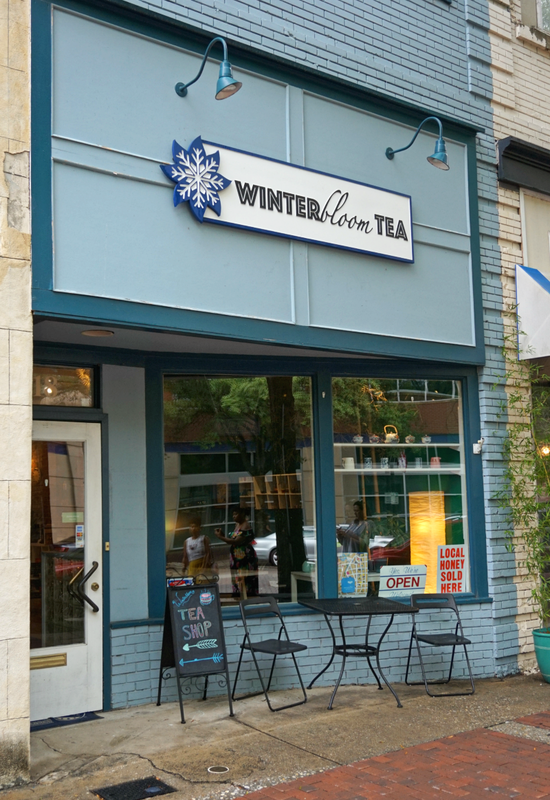 Neither did we before we stepped through the brightly colored doors of Winterbloom Tea. Another amazing addition to Hay Street, Winterbloom Tea has only been around since 2016. 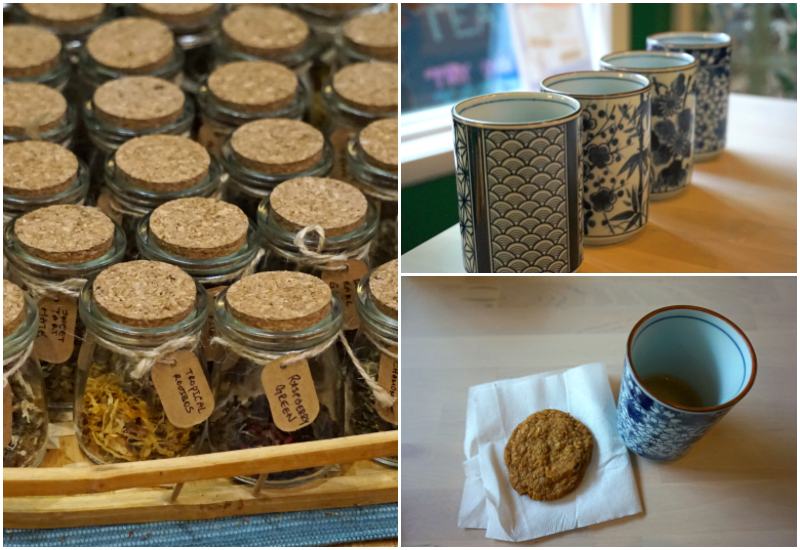 It is the perfect place for tea aficionados, or those who are interested in learning more about tea. To maximize your experience, consider visiting with a group and requesting a special tea pairing experience where you will be invited to try various desserts perfectly paired with an assortment a delicious teas. Once you've finished your tea pairing experience, be sure to check out the incredible and extensive collection of loose leaf teas located behind the register. You can also check out their handy pamphlet to find a tea that will help cure whatever ails you. 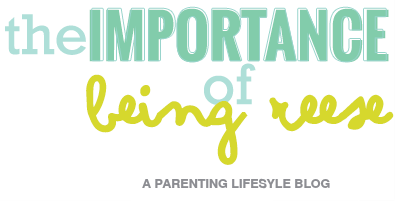 From digestive issues to insomnia, there's no shortage of remedies these teas can provide. Interested in learning more about our #SoFay17 Tour? 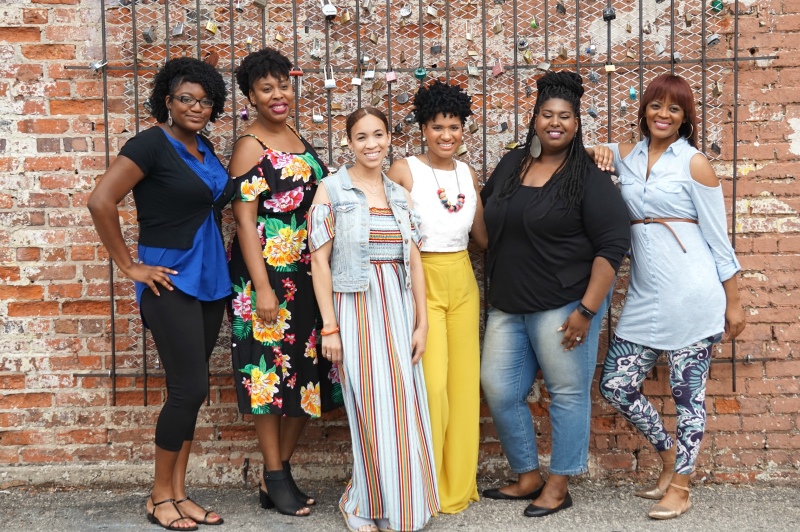 Check out the hastag on social media and be sure to drop by and visit with the lovely ladies who accompanied me on the tour to see what they had to say about Fayetteville! Sending a huge thank you to SoFluential and The Fayetteville Areas Convention and Visitors Bureau for organizing such a fun and informative tour of Fayetteville! Wall climbing looks exciting fun and I've been wanting to try it for the longest time. Too bad there's no place like that near my area. Glad you ladies had a great time exploring Fayetteville. I definitely need to check out New Deli the next time I'm there as well as the Poe House. Thank you for sharing your visit to Fayetteville during #SoFay17! Your pictures made me HUNGRY!